Scientists have presented the most comprehensive evidence to date that climate extremes such as droughts and record temperatures are failing to change people's minds about global warming. 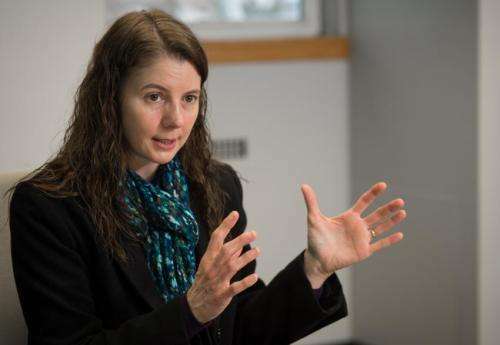 Instead, political orientation is the most influential factor in shaping perceptions about climate change, both in the short-term and long-term, said Sandra Marquart-Pyatt, a Michigan State University sociologist and lead investigator on the study. "The idea that shifting climate patterns are influencing perceptions in the United States - we didn't find that," said Marquart-Pyatt, associate professor of sociology. "Our results show that politics has the most important effect on perceptions of climate change." The researchers ran more than 100 computer models integrating just over a decade of Gallup survey responses on climate-change perceptions with 50 years of regional climate data from the National Oceanic and Atmospheric Administration. The 12-page study, which appears in the journal Global Environmental Change, includes a 42-page appendix of data from analyses producing about 800 parameters to support the findings. Some previous studies suggested temperature patterns do, in fact, influence perceptions about global warming, but none measured climatic conditions as comprehensively as the current investigation. Past research often considers a two-day window or a particular community and a single measure of temperature, not an expansive sweep of multiple climate measures as the authors of this study do. The study analyzed climatic storm-severity measures used by NOAA - temperature, drought, precipitation and wind velocity - from all 50 states in combination with the 11 years of public opinion data. "This gives us the pulse of the nation," said Marquart-Pyatt. While advocates of global warming reduction efforts hope that experience with a changing climate will eventually convince the public of the reality and seriousness of the problem, the current findings do not bode well for that scenario. Given this expansive treatment of the issue, there is "little grounds for optimism," the study says, "that public concern about climate change will be driven by future climatic conditions." Really? I have been trying to say that for months. Those of you without specific education in this topic are vulnerable to emotional manipulation, . . like you were with "WMD!". Face it, in how many areas isn't this true? The God haters insist religion causes all the wars in the world, despite all the proof to the otherwise. Evidence that homosexuality is consistent with mental disease, and proof that many websites refuse to print those facts because they can't contest them, is consistently ignored. It was established that Officer Wilson did not violate procedure with respect to Michael Brown, but hordes are still demonstrating as if he did. The "beheading" videos are patent fakes, but how many insist they are true? And there is still a refusal to recognize that, in fact, climate change comes from chemtrails, not "fossil fuels". "Terrorism", vaccines, "relativity", "evolution", all topics that survive, even thrive, aiming at the unquestioning dullards for popularity. The credibility of the predictions of the future have to be based on the assumptions used to make those predictions. The computer models used to predict future climate change are very expensive attempts at predicting the future but are so full of intrinsic errors and fundamental inabilities that their outcomes are inadequate. Too many people believe that if hundreds of billions have been spent on something then it must be correct despite all the evidence to the contrary. So, if you take something like CO2, which has been proven (as in the Earth is round proven) to trap heat, and then add more to the atmosphere (the CO2 concentrations are consistently going up), how does it NOT get hotter. This is EXACTLY the same thing as saying there's a problem predicting the temperature of water on a stove if you turn up the gas. You might not get an EXACT temperature, but you can be sure it will be hotter. but you can be sure it will be hotter. Extra CO2 is not making deserts hotter is it? No, its not because desert heat radiates quickly into space through those big, wide infrared windows into space. Rygg, do you still play tic tac toe? If you don't then you know the exact reason I'm not going to play this game with you. These are facts, you're giving opinions (contra facts), good luck shadowboxing, or finding someone to take the bait. As I have said in other posts, look up Updated Capital Costs from the EIA, and see how much it actually costs, not projected, to build the plants. But the capital costs are the least, compared to fueling and operating it over the lifetime of the facility. If you have the opportunity to put in a facility which reduces your total use of fuel by 30% would you do it? It pays off faster than others, then produces power which is essentially free. You can augment it with wind, which is already shutting down nuclear power plants in the midwest. Since old buildings are being retrofitted and new ones are really efficient, and since households actually used less electricity last year, and with the growth of self-generated power, . . it is "Paradigm Over" for the Old Ways. Folks, this is not the willy-nilly use of new technologies, we have been working on them and how to integrate them into our systems for decades. Why do we have to continually reassure you that we know how to do it? Stuck on those numbers, huh? Even after I proved they are erroneous or okay? Even as we know how to power a grid, and you do not? Keep on screaming from the sidelines. They are dumping their loser assets into another company to unload them on a gullible set of investors, who really believe in fossil fuels. Now is the chance for the Deniers to invest in their favorite and obviously the "best" technologies in their view. Time to get the money and use it to replace the mouth. Do I doubt that the climate is warming? No. A lot of the evidence seems to suggest that it is. The science isn't what I question. I question a system of carbon dioxide indulgences, managed by centralized governmental authorities. I question the notion that someone knows what's best for all of us. Centrally manged economies have been tried, tried again, and tried yet again in various societies over the last three centuries. They aren't resilient. They don't last. And most of all, the concentration of all that authority in one place inevitably leads to terrible corruption and ultimately genocide. Yet for some strange reason, while analyzing the historical record for climate, the proponents of such schemes fail to look at the history of civilizations and government. I can't imagine that such a system would be a success, and yet, that's exactly what is being peddled in practically the same reports as this research is documented. The research is good. The politics, not so much. The small amount of CO2 is not significant to 'trap' heat. CO2 levels rise inside to over 1000 ppm. How much heat does that CO2 trap? "We estimate CO2 concentrations of more than 2,000 p.p.m. for the late Palaeocene and earliest Eocene periods (from about 60 to 52 Myr ago)"
AGWites keep saying CO2 levels are now the highest, EVER. And also in the news, Kennedy has been shot. Here is how CO2 does not cause significant change. Now, AGW-ers will tell you that the 135ppm x 1 CO2's effects, drives the 435ppm x 40 H2O's gw effect. and yet... not so much. Not sure what you saying so for clarity I ask you 2 questions. Do you agree that we should stop burning coal and petroleum so that we are not pumping C02 into the atmosphere? Anyone who does not answer yes to this question confuses me. Secondly, are you saying that a true democracy, where the laws reflect the desire of most of the people ( who would be more educated in this theoretical democracy ) is what is needed to deal with climate change? Mandatory voting and free College education look like they would pair well together eh? Although this appears apparent, I certainly can personally attest to the fact it isn't all inclusive. 35 billion pounds of CO2 per year is pumped into the atmosphere. This is an uncontrolled physics experiment of never seen before proportions and people are not even cautious that this could possibly upset our environment. That this COULD exterminate our society. No sir, full speed ahead. There was a group of aristocrats in Central America that fueled the same idea. The Maya built massive plaster floors as a sign of status, this required heating limestone to extreme temperatures. They cut trees around the city to create these floors, and as their status's required more attribution the resources available to the civilization thinned. Evidence be damned, now all that's left is the floors. 35 billion pounds of CO2 per year is pumped into the atmosphere. "It is ten times as likely that atmospheric CO2 is coming from natural sources, namely the warming ocean surface, as it is likely that it is coming from anthropogenic sources. The changes in CO2 track ocean surface temperature, not global carbon emissions. Burning fossil fuels is not increasing atmospheric CO2. Recovery from the Little Ice Age, driven by the sun, is causing the oceans to release CO2. It is temperature driving CO2 release, not the other way around. Just as it has always been." Do you agree that we should stop burning coal and petroleum so that we are not pumping C02 into the atmosphere? Anyone who does not answer yes to this question confuses me. Anyone who asks such a question without an economically viable (without socialist subsidies) alternative to oil and coal is just ignorant of reality. You don't seem to understand that regardless of the source we have to manage it. Our society cannot sustain a massive shift in farming. Living in Texas, I am already extremely alarmed. Look at the water level of Lake Ray Hubbard. Texas has already slowed pumping of this lake and ran another dry to meet Dallas's demand. We need money pumped into climate studies, we need bigger computers to run the models, we need a plan to safeguard our society against unknown and massive risks which include a prolonged period of starvation, uprising, and die out of everyone you know and love. we have to manage it. It would be better to do what 'we' have done for thousands of years, adapt. Are not most of the 'lakes' in TX reservoirs, MAN made? Sounds like TX and most other govt managed reservoirs haven't priced the water correctly. die out of everyone you know and love. Worried about a zombie apocalypse too? What do you expect when the AGWites create a POLITICAL organization (IPCC) to be the 'experts' on climate? "In Canada, the progressive war on science is aimed squarely at the energy industry. A large number of Canadians believe that anything connected to fossil fuels is inherently suspect. It's not just global warming – it's that they are thought to be inherently dangerous. They leak, spill, kill birds, devastate natural spaces and poison our earth, water and air." "Fifty years ago, enlightened people campaigned to ban the bomb. Today, they campaign to ban GMOs and modern agriculture. " ""If the naysayers do manage to stop agricultural biotechnology, they might actually precipitate the famines and the crisis of global biodiversity they have been predicting for nearly 40 years." But nobody has heard of Mr. Borlaug. Nobody remembers a time when kids died of whooping cough, either. And that's part of the problem." I dunno rygge... what do YOU expect when existing powerful and moneyed entities create media outlets committed to denying science that may undermine their current wealth and status? "Non-condensing greenhouse gases, which account for 25% of the total terrestrial greenhouse effect, thus serve to provide the stable temperature structure that sustains the current levels of atmospheric water vapor and clouds via feedback processes that account for the remaining 75% of the greenhouse effect. Without the radiative forcing supplied by CO2 and the other non-condensing greenhouse gases, the terrestrial greenhouse would collapse, plunging the global climate into an icebound Earth state." Of course WV in the Earth's atmosphere has risen. It has to BECAUSE the temp rise driven by CO2 has lowered the absolute humidity and this then rises to match the new temp. A self driven process. BY CO2. The CO2 comes first. Has to. It's only in it's atmospheric cycle around 9-10 days. CO2 is there centuries.
" It's only in it's atmospheric cycle around 9-10 days. CO2 is there centuries." What I expect from the socialists is just what I get, an IPCC that wants to return the world's economy to horse and wagon. i am SO glad that you pointed that out, runrig! This is a good term for the 'watermelons', champagne socialists. Champagne socialists like Brand and many others attack GMO, vaccines, hype AGW while 'spewing' carbon all over the world. And then there are the moneyed media outlets like MSNBC and CNN that support their hypocrisy for political gain. It's useless trying to talk to Alchem about this stuff. He has decided he has it right, and there is nothing that can be said that will cause him to re-examine his flawed and incorrect "theory". When given the chance to participate in a exercise, he cried, stamped his feet, declared victory before the exercise was done, cried some more, then changed his name and tried to pretend he was someone different. Such tactics are the mark of a child or a sociopath, not an engineer (although Benni might argue differently, as he claims to be one) and certainly not a scientist, not even an amateur one. Well, at least he is not as stupid as ubamoron. Persistence of an molecule does not matter, it is the average concentration that matters. I am not sure how to get you to understand. W V has been in the environment at probably near 20,000 ppm average "forever." That individual water molecules come and go every few days MAKES NO DIFFERENCE, the IPCC is lying. No, small effects do not drive large ones. This is not a snowball effect phenomenon. The magnitude of a 2.2% increase in W V is 128x that of a 35% increase in CO2. That is to say a 435ppm increase in W V is 128x more powerful than a 135ppm increase in CO2. There are a few things likely driving higher humidity: More exposed surface area, warmer Ant/Arctic regions and the 0.85 C temperature. The last probably being the most prominent. However, IF CO2 is the driver, it should already be causing a runaway GH effect. Because it would drive water, at a rate of 4:1, and that feedback rate should be murderous. The above is just plain true. What is it about it you don't see? How, for example, individual particles trump averages? How can the small feedback effect you propose from CO2, not drive a runaway effect from water vapor? No, small effects do not drive large ones. That's the inverse of the entire point. They do. Water responds to temperature and does NOT drive it. It cannot possibly as it can only exist in absolute quantities at a given temperature. Therefore if the temp does not change, neither can the WV content. You are aware that a single molecule (representative of the maass of atmospheric WV) is only *in* the atmosphere ~10 days? So how does that drive temps up. It cannot over-saturate the atmosphere because a) it will precipitate out and b) has not got enough time to anyway. Therefore comparative to cold air at a given height (say 30000ft) warm air has more air above (tick) - and so is at a higher pressure. Therefore at 30000ft the pressure height in warm air is higher than in cold, which causes the air there to move towards colder air (lower pressure). This is why aircraft set their altimeters at a pressure - standard pressure QNH, assuming surface pressure of 1013mb or QFE, airfield level pressure. When flying at 30000ft across a baroclinic zone (jet core level - has greatest contrast) from warm to cold (usually northwards) it will be DESCENDING. It is this slope coupled with Coriolis that creates a Jet. WHICH will necessarily weaken under GW. Here endeth the Meteorology lesson. Hey that was good runrig, clear and to the point, well done. He has decided he has it right, and there is nothing that can be said that will cause him to re-examine his flawed and incorrect "theory"
Condensation and clouds, I think we agree, is not a significant factor? Water vapor is a GHG, and 40x more powerful than CO2. If you say CO2 is changing temperature, than how does an average 435ppm increase in WV not? If the effect were large it should cause a runway effect. Tells me nothing. So W V increase corresponds to temperature. I agree. So let's re-apply the math. W V is 40x more powerful than CO2. CO2 is up 135ppm, H2O is up 435ppm. Premise: If a 135ppm has driven the 0.85 temperature change, and indeed the 435ppm water change. Then the 435ppm should be driving an even more impressive change. This implies that... well I'll ask you to describe the fallacy of my reasoning. ....If a 135ppm has driven the 0.85 temperature change, and indeed the 435ppm water change. Then the 435ppm should be driving an even more impressive change. The fallacy is you have not correctly determined the *chicken* from the *egg*. Look, we have on the one hand CO2 and on the other H2O. Only one of those can be the driver ... as in it has a "degree of freedom". Only CO2 has. It has no restriction on it's increase, once it goes beyond the Earth's natural recources to sink it (mostly the oceans). H2O CANNOT move up/down when the temperature is stable. It is confined by it's environmental temperature. Cool the atmosphere and it will condense clouds and rain/snow. Heat it and clouds will burn-off, humidity decrease and allow more WV into it. Do you not see? CO2 has freedom of movement...IOW CO2 comes first and is the driver. H2O is the feedback. My friend, I'll let you work it out. You are absolutely right above, that doesn't stop WV from being a GHG. Which should cause the dramatic increase, which should increase the GHG... but it doesn't. So we simply need to start looking for another effect. Heat released by fossil fuels is ~<1/10000 Solar out put. Do you think that colossal amount of energy, which is well dispersed into the atm., just disappears? No, only a portion of it is radiated into space. Why is it important? Because today's burnt fossil fuels are stored Sunshine. It is effectively increasing the output of the Sun by 1+ >1/10000 th. Heat-energies being more difficult to be radiated at ground level.
" Nevertheless I recognize the political appeal of climate change, the rhetorical power of a threat to correlate forces, to direct their activity. Not to mention the aromatic whiff of potential economic rewards. Retrofitting an economy for a post-fossil fuel world is a business opportunity for well-connected entrepreneurs such as Elon Musk or the coal baron, radical environmentalist, billionaire, and Democratic mega-donor Tom Steyer, who is on record that the government-subsidized green energy bonanza is above all an opportunity "to make a lot of money." So much of contemporary liberalism reeks of a scheme by which already affluent and influential people increase their margins and extend their sway." Everyone knew this was the case all along. And yet, climate "scientists" keep insisting that their views are not politically driven. hogwash! How do u tell CO2 to stop being "political" then verkle ? "How does adding a greenhouse gas to the atmosphere such as CO2 NOT increase thermal resistivity ?" Where is the politics in that please ? How about asking a priest, your religion claims they have a direct line to the Source ie God ? Simple Water_Prophet I asked U before, WHY do u evade AGAIN ?